Global urea prices have rebounded in recent weeks with demand buoyant and supply tight. Producers in the East and West have not been under inventory pressure while a number of major markets, for example India, have been active. Reflecting the latest gains, Profercy’s World Nitrogen Index (charted below) gained a massive 5 points this week and has now increased by almost 10 points since mid-April. Mid-April urea values in the key export points of the Black Sea, Arab Gulf and Egypt hit lows not seen since 2010. However, price gains have been registered every week for the last month, particularly in the Arab Gulf where granular values have moved up $50-60pt. With gas-supplies seemingly improving, Egyptian urea was made available to the market this week and traded $20pt above last done. Across the globe buyers requiring May/June product have had to raise prices ideas, as evidenced by latest awards against last Saturday’s Indian urea tender. The lowest award – above $298pt cfr Krishnapatnam – was over $30pt above the award price in the previous tender in April. This still nets back to Chinese fob levels well below current producer asking prices and, as a consequence, India is currently struggling to secure large volumes. The latest price run-up sets an interesting backdrop for the upcoming meeting of the fertilizer industry in Istanbul (The 83rd Annual IFA Conference). 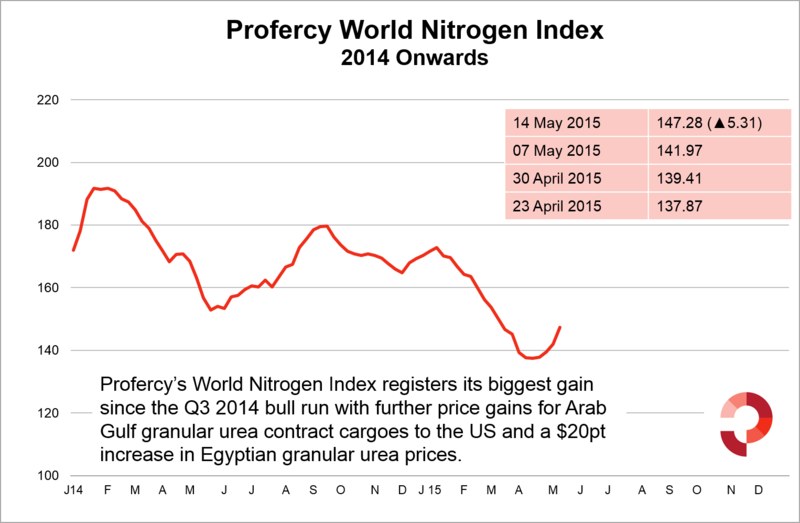 Profercy will be publishing its detailed supply, demand and price forecast for the nitrogen market ahead of the Conference and this will set out our expert assessment of the potential for the bull-run to continue into June and July. To receive a complimentary copy of our latest market forecast, as well as Profercy’s latest fertilizer market reports, please provide your details here. Profercy’s Nitrogen Service includes daily news, weekly analysis and monthly forecast reports. For more detailed information on specific products and individual markets, please sign up for a free trial or for more information on the Profercy Nitrogen Service, please click here. The Profercy World Nitrogen Index is published every week and is based on price ranges provided by the Profercy Nitrogen Service. This includes prilled and granular urea, UAN, AN, ammonium sulphate and ammonia. A full methodology can be found here.